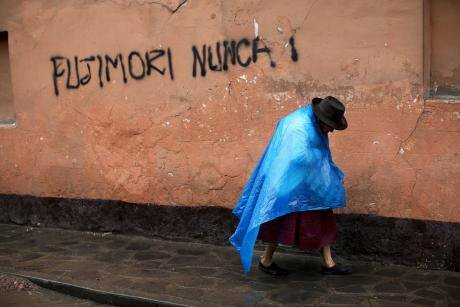 A Quecha women walks next to a graffiti that reads "Fujimori Never", in Ayacucho, Perú, in April 2011. AP PHoto/Rodrigo Adb. all rights reservedThe maelstrom of events that has taken place in recent weeks in Peru has put the country's governability in check and raised some issues which require urgent response. First of all, there was the question of President Pedro Pablo Kuczynski’s impeachment for reasons of “permanent moral incapacity”. The request was made on the basis of two facts: 1) the involvement of a company owned by the president in contracts with the corrupt Brazilian company Odebrecht while he was serving as a government minister, and 2) his failure to speak the truth when he declared that he had had no direct or indirect relationship with that company, which he later denied, as did the company. Kuczynsky's pardon order produced a new crack in Peruvian society, unleashed street protests and harsh criticism from several sectors. Freed from the impeachment proceedings thanks to the schism which this question generated within Fujimorism, the President, in a matter of hours, ordered the release of Alberto Fujimori from prison by way of pardon and right of grace. The order produced a new crack in Peruvian society, unleashed street protests and harsh criticism from several sectors, and led to the resignation of a number of officials close to the government (ministers, congressmen, advisors and high-ranking civil servants). As a result of these unsettling developments for the ruling party, the cabinet had to be reshuffled and its reshuffling incorporated two members of the opposition Aprista party – who were immediately expelled from it. As for the impeachment, the lack of definition of what "permanent moral incapacity" is, the perception that this was a disproportionate sanction for the president’s alleged lie and, above all, the attitude and political record of those who were promoting it aggressively, ended up converging to produce a sense of relief within the country’s democratic sectors when it finally became known that the proceedings had been stopped. This does not, by any means, clear up all the doubts that hover over the President due to what he himself has described as a "lack of exhaustiveness". In fact, a recent TV report revealed that when Kuczynski was previously serving as Minister of Economy and Finance, his company was paid a million dollars for consultancy work related to the issuing of Peruvian Treasury bonds through, apparently, another company owned by a Chilean partner of his. The non-impeachment of president Kuczynski seemed to lead to a political recomposing of the country - albeit with a weak government, and greater balance -, Peruvians received the smack of Fujimori's pardon for Christmas. Yet, the non-impeachment appeared as the lesser evil in the face of the bullying tactics of a political group which is even more questioned for corruption-related issues and whose ambition of totalitarian power made it quite likely that it would not be content with the president's head, but would then go for the National Prosecutor’s and the Constitutional Court members’, among others. But as the outcome seemed to lead to a political recomposing of the country - albeit with a weak government, and greater balance -, Peruvians received the smack of Fujimori's pardon for Christmas. This substantially altered the post-non-impeachment situation and provoked the unrest of practically half of the country’s citizens who consider it an affront to democracy and to the fight against impunity. Considering that Fujimori was condemned in an unobjectionable trial for murder (actually, crimes against humanity) and aggravated kidnapping (a charge that rules out all ordinary benefits), only one possible legal pardon could be granted in his case: the so-called "humanitarian pardon", granted for extreme medical reasons. In fact, Peruvian law authorizes it only if the convicted person suffers from a serious, incurable and progressive illness and if, in addition, it is considered that the prison conditions are putting his life at risk. This type of pardon finds its raison d'être in that, no matter how serious the crimes the convicted person has committed, the system cannot be based on revenge, casting aside its humanity and infringing upon the right to life of the convict (even though he himself may have despised the life of others) by compelling him to die in jail. So, a humanitarian pardon to Fujimori, no matter how displeasing many people may find it, is legally possible if the requirements established by the law are met. But there are quite a few problems surrounding the actual pardon that was granted, namely: 1) the opportunity (it was presented 3 days after the non-impeachment vote in Congress, which was won thanks to the support of its main promoters, which indicates the existence of some political agreement); 2) the form (hasty, hidden, denied, preceded by some failed attempts, having it signed by a nonagenarian); 3) the background (it is a matter of serious doubt that Fujimori’s medical condition is the one required by law). The government has refused to hand over a copy of the pardon file to the country’s Ombudsman claiming that it contains sensitive information which, if it were to be made public, would violate Fujimori's right to privacy. What there is evidence for is that an option that could have been legitimate has been twisted in order to pay back a favour, that the fight against corruption and impunity is irrelevant, and that Fujimori’s victims – who have not been attended nor repaired - do not matter. When there is a confession, you need no proof: the government has refused to hand over a copy of the pardon file to the country’s Ombudsman claiming that it contains sensitive information which, if it were to be made public, would violate Fujimori's right to privacy. However, the authority of access to information has declared that there are no grounds for the government’s refusal. And the Ombudsman, on his part, has issued a report in which he concludes that the pardon is lacking in motivation and that it fails to express the medical reasons on which it is based. This presidential decision puts Peru on the edge of the abyss of ungovernability again. This presidential decision puts Peru on the edge of the abyss of ungovernability again. It is certainly possible to grant a pardon in cases of great corruption, provided it is an exception rather than the rule, and only in extraordinary cases. Exceptional forgiveness cannot be used to encourage great corruption and impunity. On these very same days, Michel Temer, the corrupt president of Brazil, used his power of Christmas pardon to benefit several actors of the great corruption affecting his country and the region, and this earned him the forceful rejection of anti-corruption prosecutors and led to a ruling by the Supreme Court suspending this nonsense. The rule of law implies that you have to face the consequences of what you do, in due process. You cannot allow exceptions outside the law, nor can you allow those to whom you have entrusted power to use it to encourage impunity by turning the system around. A few days ago, after Pope Francis left Peru, it was rumored that the president was going to resign. This, it seems, will not happen. However, the government has been so weakened after all this that is quite likely that, if there is any new indication of the president's involvement in conflict of interest or corruption cases, he will be forced to step down.